This exquisite limited edition print represents Team Mclaren in the 2009 Formula 1™ season. 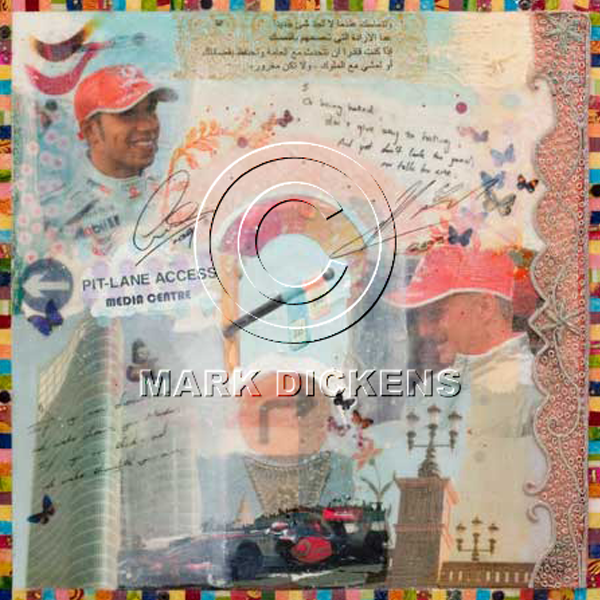 Featured on the print are F1™ drivers Lewis Hamilton and Heikke Kovalainen who were photographed by the artist. Mark Dickens displays the beautiful Middle Eastern culture of Abu Dhabi with stunning architectural images of the Al Ittihad Square, the modern ADIA tower and a beautiful lantern form the Emirates Palace. To represent the Formula 1™ team he includes the racing McLaren F1™ car. He also incorporated decorative tile designs taken from within the Sheikh Zayed Mosque throughout and pieces of local fabrics to create a stunning unique border around the print. Mark Dickens invited Lewis Hamilton and Heikke Kovalainen to hand-write segments from Rudyard Kipling’s poem ‘IF’, which appear on the print in both English and Arabic.